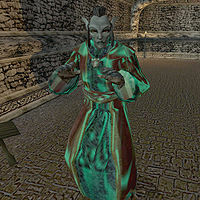 Llaren Terano is a hostile Dunmer sorcerer and a worshipper of Molag Bal. He is a malicious and powerful sorcerer currently residing in the Rotheran stronghold along with his followers. In Rotheran, they have set up a secret gladiator's arena where he pits slaves against daedra and animals to fight to their death for his amusement. He has gotten his hands on the legendary Ice Blade of the Monarch. The Imperial Cult Oracle Lalatia Varian sent Adusamsi Assurnarairan to recover the blade for the cult, but Llaren caught her, stripped her of her clothes and ring, and threw her into the Arena pit to be used as a gladiator. You will be sent by Lalatia Varian instead to recover the blade from Llaren, and rescue Adusamsi from certain fate of being killed or sold into slavery. Despite only being a modestly leveled NPC with moderate health, Llaren Terano has 2000 magicka, which is 500 more than Tribunal God Almalexia and one of the highest in the game. This page was last modified on 13 July 2018, at 00:08.